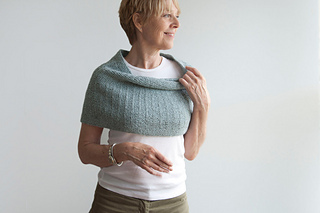 Borrowing yarn and stitch pattern from its predecessor Robin’s Song, I’m delighted to present Robin’s Nest, an elegant loop of the same soft texture, in a wrap this time to take the chill off the seasons – any season. 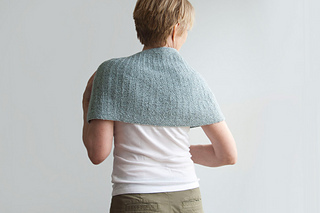 This design is worked from the bottom up and in the round, with subtle shaping made by gradual decreases into its Garter Rib – an easily memorized 4 stitch by 2 row repeat. You’ll find this to be a quick and enjoyable project, with an excellent result, I’d say. Enjoy! 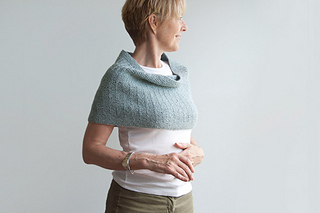 Shown in Owl by Quince & Co. (50% American Wool, 50% American Alpaca; 120 yds per 50g skein); color – Cielo #318; 3 skeins, or for comparable yarn, approx 300 yards / 275 m.
Long-tail cast on, circular knitting, decreasing (k2tog, p2tog). 4 page PDF includes pattern instructions, photographs, schematics, stitch description, and definitions for relevant abbreviations.